Does Larry Hogan Really Care About Jobs? Larry Hogan has worked hard to portray himself as a Jobs Governor. In nearly every one of his public appearances, speeches and press statements, he talks about jobs, jobs, jobs. Here’s a quote from his inaugural address that has set the tone for his administration. The statement above deserves a big asterisk. In practice, Hogan’s enthusiasm for jobs depends on where they are. When jobs are located at a Northrop Grumman facility in Anne Arundel County, the Governor proposes tens of millions of dollars in state subsidies for them. When employment growth lags in the Eastern Shore and Western Maryland, Hogan promises a new jobs initiative. But when the Red Line was projected to add billions of dollars in economic activity and over 15,000 badly needed jobs to the City of Baltimore, Hogan cancelled it. And last week, he sent another large public works project into limbo: Montgomery County’s Corridor Cities Transitway. What do Montgomery County and the City of Baltimore have in common? You guessed it – they voted for Hogan’s opponent in the last election. The Corridor Cities Transitway (CCT) is one of the state’s preeminent transportation projects, and one that has an awful lot of job growth tied to it. The CCT, a 15-mile Bus Rapid Transit Line from the Shady Grove Metro Station to the southern part of Clarksburg, has been planned since the 1970s. It would link some of Montgomery County’s fastest-growing places, including Gaithersburg, Germantown, Clarksburg, the Life Sciences Center and the federal government’s National Institute of Standards and Technology, in an area that has few transit options. A 2011 economic impact analysis by Parsons Brinckerhoff estimated that the project would create $2.2 billion of economic activity through 2050 and would create over 6,000 jobs during its construction phase. Those jobs would go to craft employees like carpenters, laborers, operating engineers, cement masons, iron workers and electricians – blue-collar workers whom the Governor cultivates. Governor Hogan is uniquely qualified to understand the ties between growth, development and jobs. He is, after all, a real estate developer who has made a fortune building projects not so different from those that would be located near the CCT. He requires no education on the economic merits of this issue. But the politics are a totally different matter. The Governor’s political play is obvious: he gets to kill (or at least indefinitely delay) a transit project in a blue county so that he can spread highway money around to the red counties who will presumably vote for him. And because he (barely!) allowed a stripped-down version of the Purple Line to proceed, he can ax the CCT and still raise money from his friends in the real estate industry. In economic terms, the CCT and its associated development would be a huge win for everyone around the state. That’s because the state government is the primary recipient of income tax revenues from new residents, and it’s the only recipient of sales taxes and corporate income taxes from new businesses. Because of how Maryland’s wealth formulas work, the huge majority of those state revenues would not stay in MoCo – they would go to the poorer counties of the state, many of whom are in rural areas that vote in huge numbers for Hogan. In his effort to score points with his supporters, the Governor is actually damaging their economic interests. So what does the Governor really care about? Is it jobs? Montgomery County has adopted plans for a bus rapid transit system (RTS) of nearly 96 miles. This system includes not only the long planned Corridor Cities Transitway (CCT) of 15 miles but a separately planned system of nearly 81 miles. Proposed and pushed relentlessly by at-large Montgomery County Councilmember Marc Elrich, the plan to add 81 miles is the most ambitious effort to expand public transit in the area since Metro. While other jurisdictions, including DC and Alexandria, are ahead of Montgomery in moving ahead with RTS, Montgomery’s is the most extensive network. 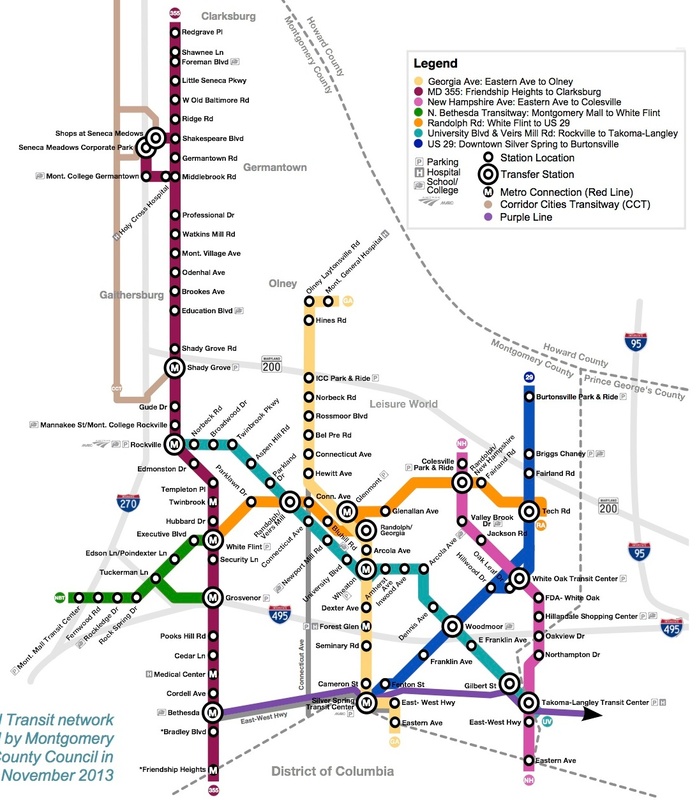 The above schematic map shows the proposed routes as well as the planned light-rail Purple Line and CCT. 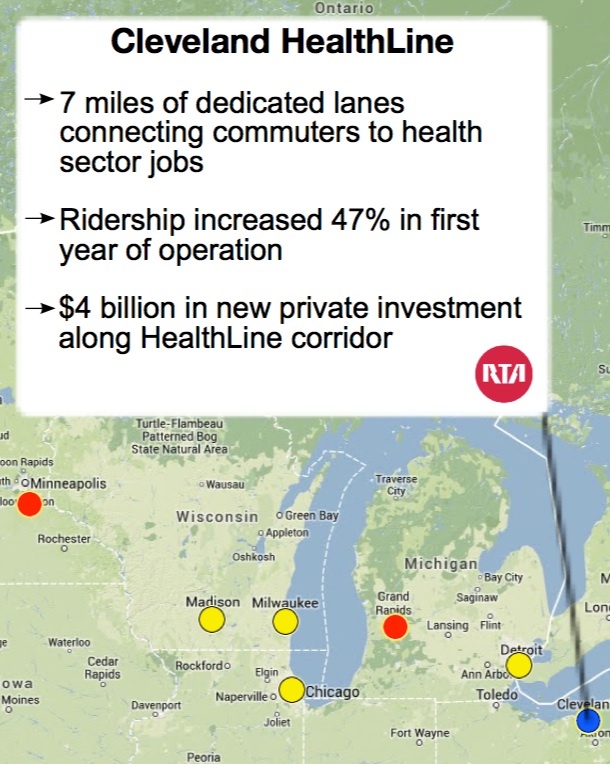 The map produced by Communities for Transit, an RTS advocacy group, uses the familiar Metro system design, which makes it look attractive but also misleadingly suggests that RTS is heavy rail like Metro. It’s not. Repeat: map looks like Metro; system is not Metro. On the other hand, I understand the drive by proponents to avoid the word “bus.” In the DC area, people associate the buses with Metrobuses–the slowest still moving form of transportation ever invented. Drivers perceive buses as barely moving hulks to avoid and to pass. Though RTS is not heavy rail, it is also definitely not Metrobus. RTS buses move much faster and are much nicer, more analogous to light or heavy rail cars. These buses are also designed to approach platforms at level–again like Metro or light rail–so there is no climbing up or down. Greater speed than conventional buses is achieved because RTS buses usually travel in their own dedicated lanes. There can be two lanes on either side of the street along the curb or two in the median. Alternatively, in tighter areas, there may just be one lane that switches direction. Buses traveling in the direction of heavy traffic use the dedicated lane while buses going in the other direction travel with regular traffic. In some areas with little room, the buses may have to travel in regular traffic in both directions. However, even in these areas, RTS buses can go faster than regular buses because they communicate to hold the traffic lights so that they can make the lights if they are close to the light but it’s about to change. 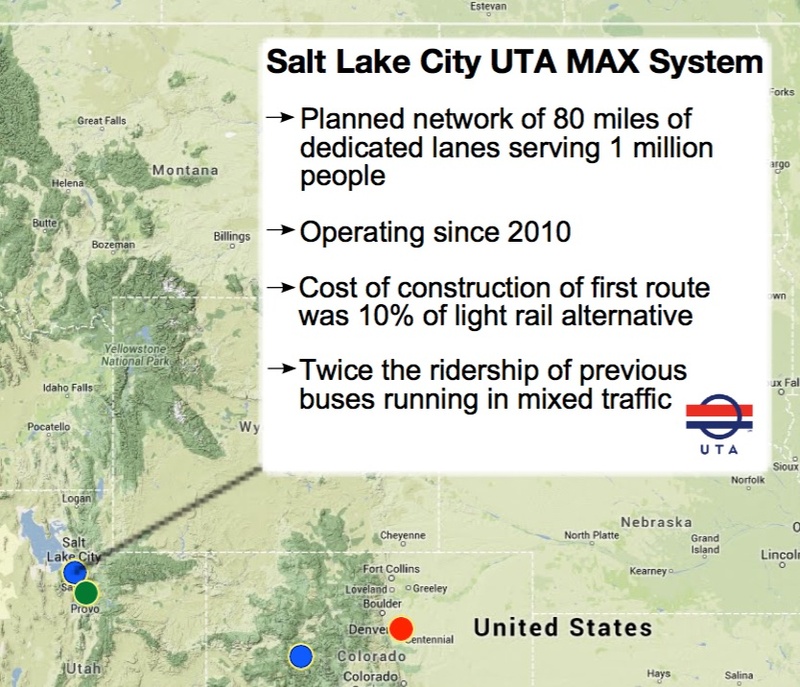 In Salt Lake City, light rail would have been ten times as expensive as the RTS alternative. The price difference means that Montgomery can get far more bang for the buck with RTS. Indeed, the CCT was originally planned as a light rail but is now expected to be a bus rapid transit system, so that it is financially feasible. The low cost is critical because, even with the Governor’s successful drive to take measures to expand Maryland’s transportation fund, there is not nearly enough money for all of the State’s transportation priorities from roads and Baltimore’s Red Line to MARC and Metro (those elevators. . . ). One of the most appealing aspects of RTS is the potential, and it remains just potential, to help weaken the battles between civic groups and developers. Developers want greater density while civics worry about the impact on infrastructure, especially the increased traffic. The Montgomery RTS plan allows more growth to occur in the context of a system designed to address heightened traffic and also to spread development, along with its benefits and problems, around a much larger area rather than one or two nodes. It recognizes that Montgomery remains a spread out suburban area even as we develop multiple new urban centers. And growth needs to occur to provide jobs and income, as well as to pay the taxes to regenerate our aging infrastructure and expand it. The key is to invest the public transit money wisely.